Marc Garneau just before noon today, March 13, held a press conference in Ottawa to address Transport Canada’s position on the growing worldwide grounding – by both airlines and aviation governing bodies – of Boeing 737 MAX 8 and MAX 9 aircraft over the past four days, following the crash of Ethiopian Airlines flight ET302 on Sunday, March 10, in which 157 people died, including 18 Canadians. No cause has yet been identified in the Ethiopian Airlines ET302 disaster, but concerns grew this week based on similarities to the October 29, 2019, fatal accident involving a MAX 8 (flight JT610) operated by Lion Air, in which 187 people died. With the investigation into the Ethiopian Airlines 302 disaster ongoing, no connection has been made between the two flights. Garneau then issued a Transport Canada safety notice to suspend the operation of Boeing 737 MAX 8 and MAX 9 aircraft in Canadian aerospace, which includes international operators of the aircraft and domestic operators Air Canada, Sunwing Airlines and WestJet. 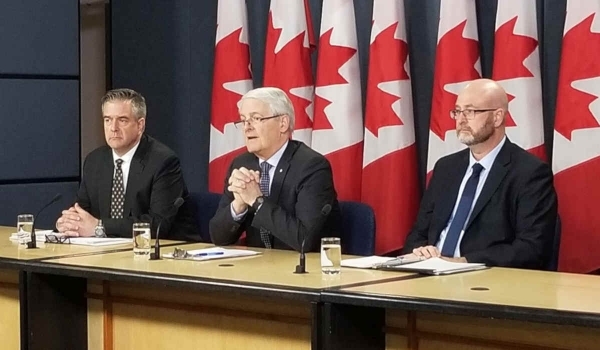 Garneau explained, that shortly after the ET302 accident, he convened a panel of Transport Canada civil aviation experts who consulted with the industry, international partners, and those actually flying the 737 MAX to conduct an assessment. “The advice they have provided is based on the information that they have been receiving. The requirements for new procedures and training for Boeing 737 MAX 8 and MAX 9 flight crews, that we have already put in place here in Canada,” he said. Investigations into the Lion Air crash focused on the 737 MAX anti-stall system, designed to prevent a plane from pointing upward at too high of a rate and angle, creating issues with measuring air speed and altitude. “The angle-of-attack sensor was faulty on the Indonesian flight [JT610] and essentially gave the impression that the nose was too high,” explained Garneau this morning, noting the software, called MCAS, and pilot countered each other more than once just moments before the JT610 accident. Garneau also noted the development of software fix in relation to MCAS was put into motion after Lion Air investigation, which is likely to be put into place by all 737 MAX operators in the coming weeks. He again urged caution in connecting the causes of the two accidents, even as Transport Canada felt the new information it used to issue the suspension of the 737 MAX in Canadian airspace crossed a safety threshold. Garneau continued to describe the satellite-tracking data analyzed this morning, which is commonly collected when aircraft take off to provide the course of flight and also an aircraft’s vertical profile, as well as any fluctuations in that vertical profile. “My experts have looked at this and compared it to the flight that occurred with Lion Air six months ago in October; and there are, and I hasten to say not conclusive, but there are similarities that exceed a certain threshold in our minds with respect to the possible cause of what happened in Ethiopia… and that is why we’re taking these measures,” he said. Transport Canada has been in close communication this morning with Canada’s 787 MAX operators about the safety notice, noting there was “no push back” because they realize the importance of these safety measures. Transport Canada also communicated its decision this morning with the United States Federal Aviation Administration (FAA), which on March 12 issued a Continued Airworthiness Notification for the Boeing 737 MAX.